It’s hard not to be amazed by the dramatical development of technology, for which the traditional mechanical door lock is getting threatened. For one thing, today’s unlocking technology is more and more mature, which has put the traditional door lock and the home safety in peril. What’s more, the appearance of the smart home door lock is aiming to take its place. In our developing society, the smart home door lock especially the fingerprint door lock is warmly welcomed by publicity. So what on earth can the fingerprint door lock bring to us? How to choose the one for the sake of security? What to do when encountering some problems using it? This article is about to answer your questions about it. What can the fingerprint door lock bring to us? People’s fingerprints are unique. In theory, only two of the 15 billion people will coincide. The finger itself is part of the human body, so it is used as a “portable key”, which is great convenience for modern people. Nowadays, fingerprint door locks on the market are of different kinds, sometimes you may be dazzled when selecting one. Here are some factors you are expected to take into account. 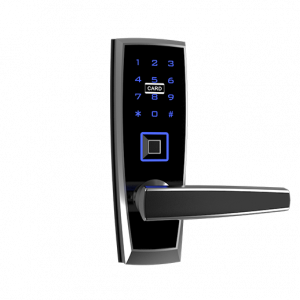 Many manufacturers may overlook the essence of a fingerprint door lock. They may roll out a fingerprint door lock, of which the selling point is just the outlook or other minor functions rather than the core technology like the fingerprint technology. Actually, a fingerprint door lock should demand the sophisticated technology of fingerprint recognition. First of all, it should adopt the fingerprint repair technology. This means the lock can adjust and calculate itself according to your fingerprint pattern. When your fingerprint is entered, the system will cover the original fingerprint with the latest fingerprint. That’s why I have to mention the bioelectrical induction technology, which means the lock can identify users’fingerprints by evaluating one or more distinguishing biological traits. 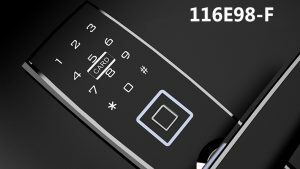 Take Molilock as an example, its 116E98-C fingerprint door lock is equipped with a bio-semiconductor fingerprint scanner, which would reject the copied fingerprint. Therefore, you don’t have to worry that others would unlock it by stealing your fingerprint. We all know that the general lock body needs to be locked with a key or by hands, while a good fingerprint door lock can close and lock without any other operation, which is able to prevent people from forgetting to lock the door. 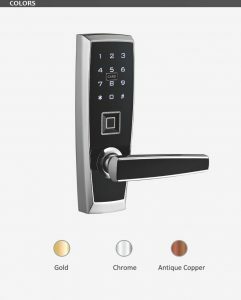 In addition, adopting more advanced technology than the traditional one, most of the fingerprint door locks in the market can send the alarming information to the owner once someone is breaking it. This is one of the functions of 116E98-C.
Aside from that, it’ll be cool with the anti-peek function. Through this way, you would no longer be embarrassed when you need to open a safe or door. You can enter many digits at will, and it would be ok as long as 6 continual digit password in the beginning, the middle, or the end is correct. If you are bothered to choose the size, you are recommended to get relatively small one. In this way, it won’t take up much space of your door. And this is the designing concept of 116E98-C, which is cost-effective for being intelligent as well as delicate. What to do when encountering some problems using it? Now，I’ll talk about the problems you should be concerned about when you are using the fingerprint door lock. The first is fingerprint recognition. If the recognition is not high and the fingerprint of the same finger requires to be recorded several times when it is input. It also shows that the lock error probability is low; in other words, it is trustworthy. If this is not the case, consider whether it is a fingerprint conductor’s problem. Generally, it is easy to use when it is installed. After a while the recognition begins to decrease and you have to reconsider entering new fingerprints. Besides, people would probably ask”What if it gets wrong when identifying the fingerprint”. Since most of the fingerprint door locks provide more than one way to unlock, there are still ways like inputting the password, swiping the card or using a mechanical key. Literally, you don’t have to worry about being not capable of unlocking the door. Here comes to the problem of running out of electricity. In general, a good fingerprint lock can be used for more than half a year after the battery is installed. If there is no power, it will alarm in advance. Even if the power is about to be off, it can be used for three to five weeks, allowing you plenty of time to change batteries. If there is no electricity, some will have an emergency power supply. Or you can buy a 9v power supply, and you can get it done without distinguishing the negative and positive of batteries. Last but not least, after-sales service is what you should place much importance. You are supposed to see if there are after-sales service outlets, specialty stores, companies or other places that can provide relevant service nearby. This is crucial for you to solve problems. 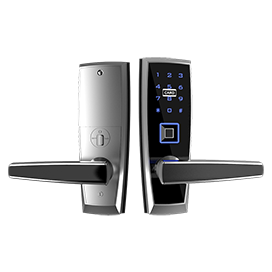 Want to learn more about the fingerprint door lock? Visit http://www.molilock.com.cn to figure it out.